Italy, a founding member of the European Union and the 4th largest economy of the block (by nominal GDP), gained a new government in the first semester of 2018 – a coalition of South-orientated anti-establishment the Five Stars movement and of North-leaning anti-immigration the League Party. Bringing together two often divided regions of the country, the government has joined a wider European populist front. However, its clash with Brussels during the second semester of 2018 over budget controversies have surprised many experts. After Italy’s Prime Minister Giuseppe Conte’s meeting with the president of the European Commission, Mr. Jean-Claude Juncker, in which a general agreement to lower Italy’s deficit target was widely publicized, followed by Italy’s parliament approval of the revised budget for 2019, reducing it from 2.4% of GDP to 2.04%, the challenge is on the government to generate growth while tightening its belt. A new budget is a very important test for a new Italian government, which was able to win the elections in many senses due to its economic promises. From introducing a new flat tax - 15% or 20% of income, increasing expenditures on pensions and effectively introducing a basic income – “citizens’ income”. As the country experiences very high youth unemployment levels – something of a personal experience for Mr. Di Maio, a former resident of the Naples province, - his government was ready to lobby hard for its budget plan (especially, as the European Elections are coming, with some members of the Italian government and their allies, calling for an “alternative” Europe). This sends a very strong message to domestic audience and foreign investors. With Italy fighting its way to approve the budget, we wonder what procedures countries in the EU usually follow to adopt their budgets. Every country in the EU must send its budget draft to the European Commission for approval before the 15th of October, in an accordance with the powers the Commission received in 2013. As Reuters reported in 2018, the European Commission has one week afterwards to identify “particularly serious non-compliances with the budgetary policy obligations” – as the deadline for it is usually the 22nd of October. Then, by 29th of October, Brussels has two weeks to refuse a budget proposal, sending an official demand to non-compliant countries to improve its plans. In this event, the country gets three weeks – by 19th of November (if a refusal comes on 29th of October), to resubmit a revised draft with improvements targeting problematic points. Usually then, by 10th of December the European Commission would comment again on a revised budget, indicating whether the country has improved its statistics. At the end of the year summit, European leaders are likely to discuss non-compliant members, thus increasing market and peer pressure. In a new year, around early February, the Commission publishes its economic forecasts for two-year period - including debt, deficit and growth predictions. If the EU data and of the country under EDP does not match, it may open the way to introduce sanctions. Then, it will take some time to start sanctions procedures – potentially, expecting them in April, but maybe earlier – if required. “Excessive deficit procedure” (EDP), developed under Stability and Growth Pact, is a corrective arm to make sure countries demonstrate sound public finances. Criteria are: 1) the budget deficit not exceeding 3% of GDP and 2) public debt not exceeding 60% of GDP. Would the budget have helped? 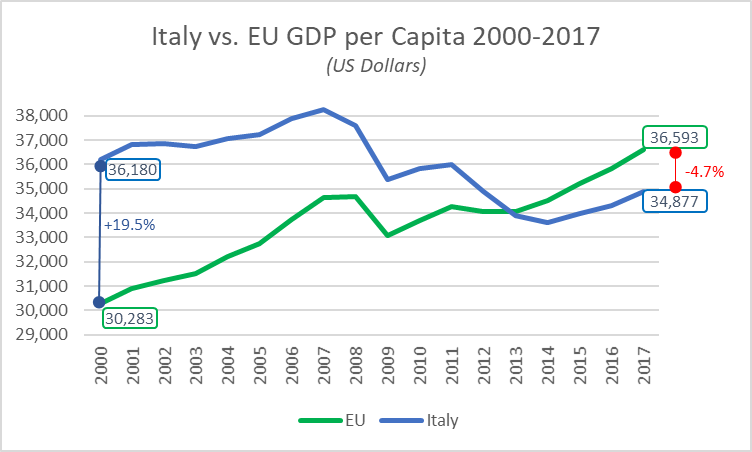 However, now that discrepancies with Brussels have settled down for 2019, is the budget really the solution the country needs to generate growth and improve the life of Italians? 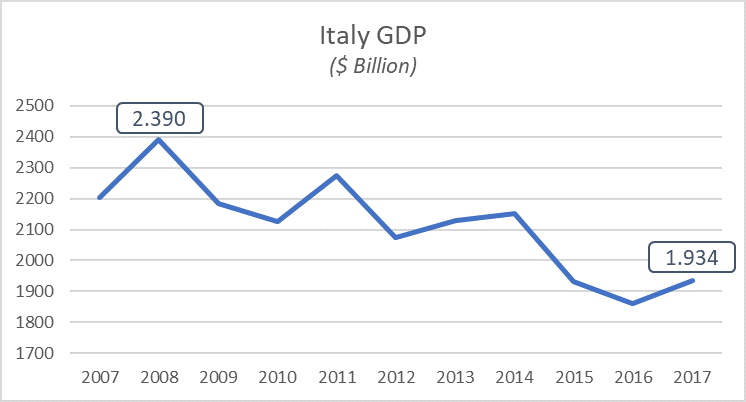 Italy have not recovered from the 2008 economic crisis, with its GDP is still 19% below the levels reached 10 years ago ($2.391 Billion in 2008 – $1.935 Billion in 2017) and 2017 was the first time its economy grew above 1%. Moreover, GDP per capita today is less than in 2000. This might be explained because 95% of Italian companies have less than 10 employees, and they remain among the lowest in the labour productivity of the EU as many companies have failed to invest in R&D and human capital, unfortunately its productivity is 3% below its highest peak in 2008 and with a downward trend that highly differs from the EU productivity upward trend, which has been increasing close to 10% since 2008. IMF warns that the budget couldn’t help and markets got worried – as the pressure on government bonds started in May 2018, followed by a sell-off in Italian debt and a fall in the country’s bank stocks, finishing the year with a -2% total return on the 10-year bond, compared to the positive 3%, 3% and 1% returns by German, Spanish and French 10-year bonds respectively. But what else could improve the Italian economic situation? Another policy which the Italian government wants to introduce is massive investments into infrastructure. After the bridge incident in August 2018, the government has pledged to invest more into improving existing roads and construction of new ones, as well as overall increase in financing of this sector. Infrastructure investments is an important part of government policies worldwide, as it not only improves connections between different points, it also has a positive effect on the economic growth – being a good example of interventionist supply side policies. According to the IMF, the Italian economy requires the implementation of structural reforms, fiscal consolidation and bank balance sheet strengthening. The structural reforms are based on strengthening labor market policies and not increase uncertainty by the payment of citizens because of their economic condition. Also it proposes to liberalize product markets rising productivity and to tackle corruption. The fiscal consolidation proposal by the IMF proposes that any public investment the government wishes to implement must serve as a kickstarter of additional revenues and that it must also increase the speed of the economy by improving the tax system. However, the expanding must be at a modest pace without going above the debt levels as established by the EU. And finally, bank balance sheet strengthening must not only concentrate in reducing non-performing loans and improvements in governance so the banks could lend more, it must also include enhancing efficiency, aiming to reduce the financial costs for consumers. In conclusion, Italy, the fourth biggest European economy and one of the most visited countries in the world has major political challenges. Not only because the current coalition between the north and the south have to co-govern, but also because getting a local consensus on the fiscal budget that fulfils the EU requirements is just the beginning of its mounting challenges. Unfortunately, the country have had a difficult time generating growth over the past 10 years, but certainly 2017 generated the spark of a potential new upward trend in growth and economic expansion. The good news is, there are multiple policies that could be implemented such as the ones proposed by the IMF just to mention a few, and it is in the best interest of the European Union to help the country as it has supported Italy in the past with the Stability and Growth Pact (€30 billion between 2015 and 2018).